Following in the tradition of music documentaries like Searching for Sugar Man, Jay Bulger's award-winning and frequently hilarious portrait of a troubled genius, Beware of Mr. Baker, is an insightful, detailed and boldly original film, featuring contributions from Carlos Santana, Stewart Copeland and Lars Ulrich, as well as Baker’s band members Eric Clapton and Jack Bruce. If you've not seen it yet the reviews should give you a taste of its appeal. Peter Bradshaw in The Guardian had this to say of it: "Probably music's angriest old man, Baker gives the American journalist and film-maker Jay Bulger pure film gold," Anthony Quinn in The Independent assures us that "Director Bulger has braved this dragon's lair, and brought back treasure," and Ali Catterall in Q Magazine called it "One of the most jaw-dropping rockumentaries ever made." 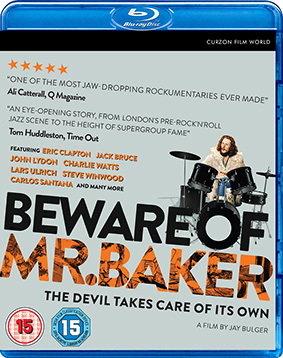 Beware of Mr. Baker will be released on UK Blu-ray and DVD on 22nd July 2013 by Curzon Film World at the RRP of £15.99 for the DVD and £19.99 for the Blu-ray. The only extra feature listed is a theatrical trailer.